I was making for Mary, who likes modern brights, geometrics, and typography and dislikes pastel. 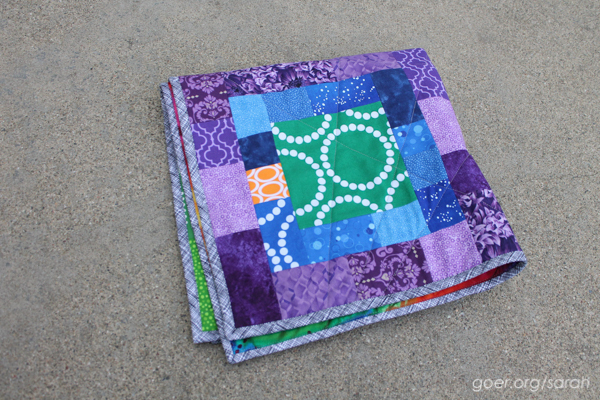 I decided to use my quilt block (tutorial coming soon... just need to write it up and find a couple testers) that I designed for Antioxidant Delight to make her quilt, but with no borders, so I'd stick to the 24" x 24" maximum size restriction. I chose an assortment of rainbow colored blenders for this rendition and named it "Boxed In Rainbows". 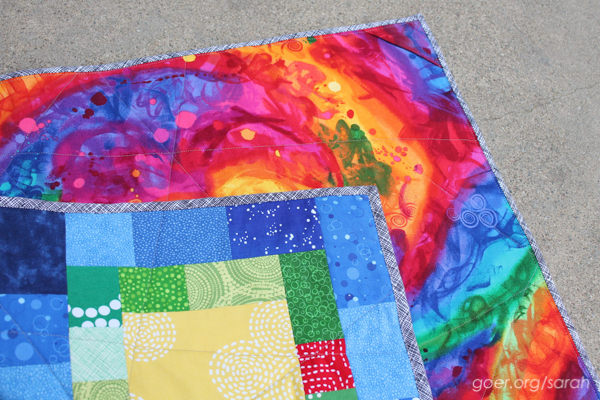 I struggled with wanting to do some epic free motion quilting, but in the end I took inspiration from my son's quilt and did edge to edge straight lines "wherever" until I felt done. 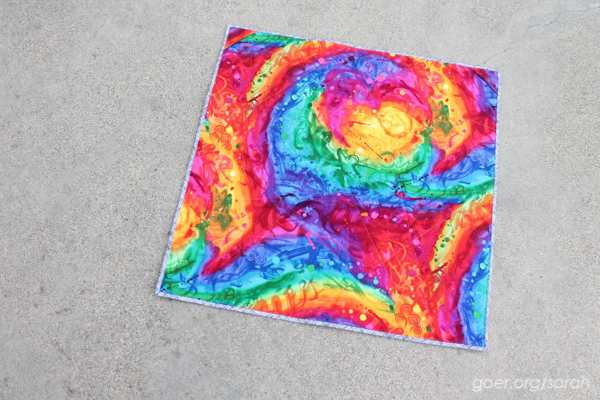 I bought the amazingly colorful background fabric from a vendor at the SCVQA quilt show. I'm trying to track down more of it, because I wish I'd bought the whole bolt! 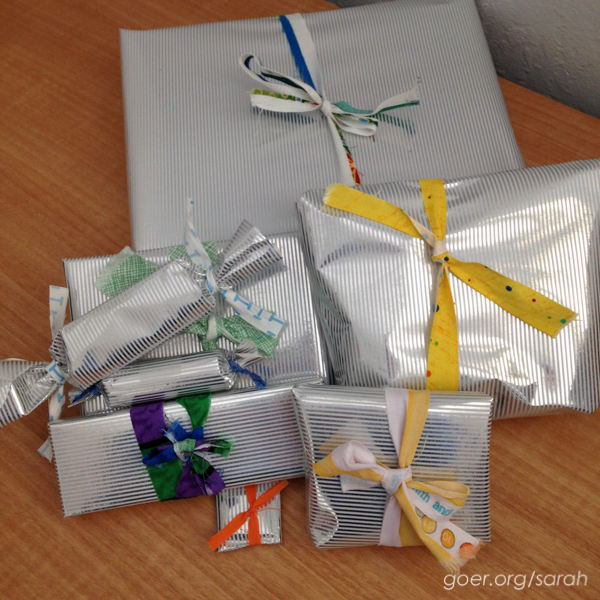 I find it fun to put together some extras to go with my swap packages. Sticking with the rainbow theme, I included skittles, rainbow colored magnets, a little airplane and rainbow pin and a rainbow selection of note cards. I also included a spool of heavy weight aurifil thread, some wonder clips and a selection of tea, including my favorite, Wild Sweet Orange. Linking up to Finish it Up Friday and Needle and Thread Thursday. Posted in Quilting. 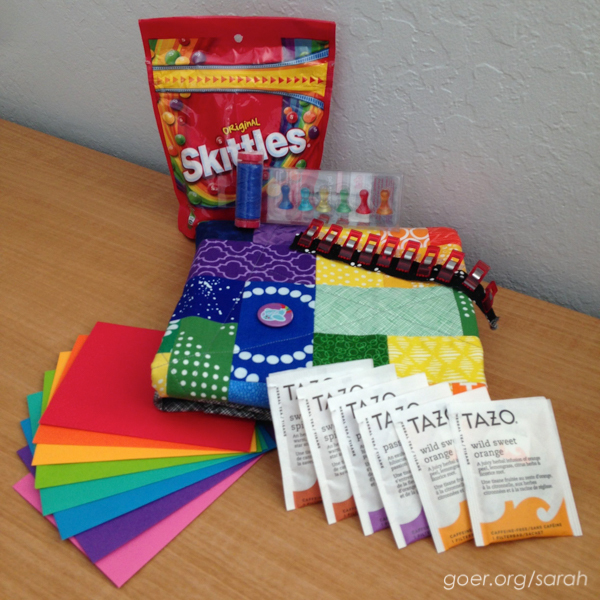 Tags: #rainbowminiswap, mini quilt, quilt swap on April 9, 2015 by sarah. Such a fun quilt to see. I wish you had bought the whole bolt too with that fabric. It is fabulous and so colorful!! 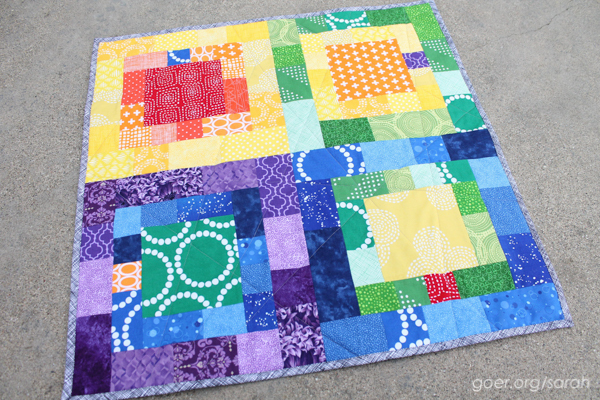 I love the bright colors in the mini quilt, and I hope Mary does, too! What a lot of fun extras you included. 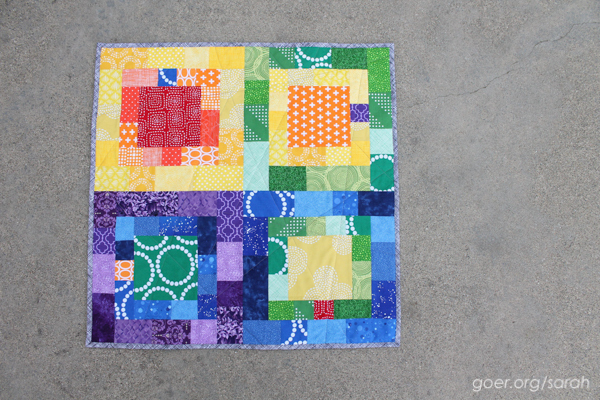 Awesome quilt block! I do love that background fabric. If you find more of it share the source with us! Thank you, Kat! Will do! Wow, you've certainly been busy with swaps this quarter. This is another great finish. Yes, yes I have. I'm dialing it back and not signing up for any more at the moment, though I have 4 (I think) open swaps that ship in the next couple months so they'll be keeping me busy a bit longer. I'd love to get involved in a Round Robin after that.